For the first time, scientists have spotted something wobbling around the black hole at the core of our galaxy. Their measurements suggest that this stuff—perhaps made of blobs of plasma—is spinning not far from the innermost orbit allowed by the laws of physics. If so, this affords astronomers their closest look yet at the funhouse-mirrored space-time that surrounds a black hole. And in time, additional observations will indicate whether those known laws of physics truly describe what’s going on at the edge of where space-time breaks down. Astronomers already knew that the Milky Way hosts a central black hole, weighing some four million suns. From Earth, this black hole is a dense, tiny thing in the constellation Sagittarius, only as big on the sky as a strawberry seed in Los Angeles when viewed from New York. But interstellar gas glows as it swirls into the black hole, marking the dark heart of the galaxy with a single, faint point of infrared light in astronomical images. Astronomers call it Sagittarius A* (pronounced “A-star”). For 15 years researchers have watched that point flicker—and wondered why. Occasionally, it flares up 30 times brighter in infrared light and then subsides, all within just a few minutes. Now, though, a team based at the Max Planck Institute for Extraterrestrial Physics in Garching, Germany, has measured not just this speck’s brightness but its position with staggering precision. When it flares, it also moves clockwise on the sky, tracing out a tiny circle, they find. But one particular interpretation stands out, the team argues. This wobbling likely comes from “hot spots,” glowing blobs of magnetically heated plasma orbiting right above the black hole’s gaping maw at almost one-third the speed of light. As these hot spots circle, the black hole’s immense gravitational forces twist space-time itself into something like a lens, one that flashes beacons of light across the cosmos like a galactic searchlight beam. The idea, first proposed in 2005 by Avery Broderick, now at the Perimeter Institute of Theoretical Physics and the University of Waterloo in Canada, and Avi Loeb of Harvard University, would explain why the black hole appears to flare. “It seems like they’ve got something really exciting here,” added astronomer Andrea Ghez, a longtime competitor to the European team at the University of California, Los Angeles. 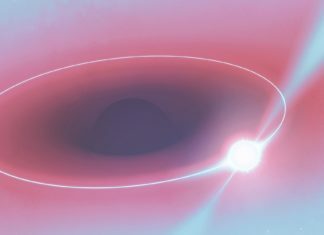 If these rotating flares are due to hot spots in the way that Broderick and Loeb imagined, additional flares will help reveal the black hole’s “spin,” a measure of its rotation. And it could also provide a new way to poke and prod Einstein’s theory of general relativity in the flexed space-time at the mouth of a black hole. Light from the four telescopes at the Very Large Telescope array in Cerro Paranal, Chile, can be combined to create, in effect, a single, enormous telescope. Since the 1990s, Ghez’s group at UCLA and the European team, led by Reinhard Genzel of the Max Planck Institute for Extraterrestrial Physics in Garching, Germany, have used ever-sharper techniques to resolve the orbits of stars right around the galactic center. Earlier this summer, Genzel’s team published a measurement of how general relativity is affecting the light of a star now passing close to the black hole; a similar paper by Ghez’s team is now under review. “It’s a remarkable moment, in terms of these experiments’ ability to start probing how gravity works near a supermassive black hole,” Ghez said. But since last year, the European team has had a unique tool—the power of four giant telescopes working together in a project called GRAVITY. On a typical night, the European Southern Observatory’s four 8-meter telescopes on Cerro Paranal, overlooking Chile’s Atacama desert, loll in different directions on the sky. GRAVITY pulls them together using a technique called interferometry that combines observations from multiple telescopes to produce artificial images that only a preposterously huge real telescope could make. To do this in infrared wavelengths—close to what human eyes can perceive—requires blending light in real time to avoid losing crucial information. So on July 22, when Sagittarius A* flared, the light collected by each scope traveled through a Rube Goldberg–like setup of mirrors and fiber-optic cables that traced out a path with a total length that varies no more than 1/1,000th the width of a hair, said Frank Eisenhauer, a physicist at Max Planck in Garching and the leader of GRAVITY. Then, inside a 3-ton freezing toolbox of optical tech, these light waves mixed together, their peaks and troughs combining and canceling to produce position measurements with impossible crispness. Even after all that, GRAVITY still didn’t have high enough resolution to make movies of the three flares it saw—the one on July 22 and two others. But its measurements of the faint speck wiggling on the sky promises to narrow down the multiple options of what’s causing Sagittarius A* to flicker in the first place. If you could see them up close, the flares might be lumps of hot plasma shot outward from the black hole, in jets of material focused and launched away by magnetic fields. Or they could be hot clumps out in the wide Frisbee of gas draining into the black hole, or other possible disk structures like spiral arms. In all these cases, the flaring and dimming of light would come from the material itself glowing hot, then cooling off. Broderick and Loeb’s idea also involved plasma blobs zapped by heat. They would form close to the black hole, not unlike what happens in a solar flare. Above the surface of our sun, a briar patch of magnetic fields snag together, spurting out flares of heated plasma when the fields snap into new shapes. Something similar could happen in the gas right around a black hole, which also hosts strong, tangled magnetic fields. In this case, though, the modulation in brightness would come not from the blob itself but from the blob’s orbit. 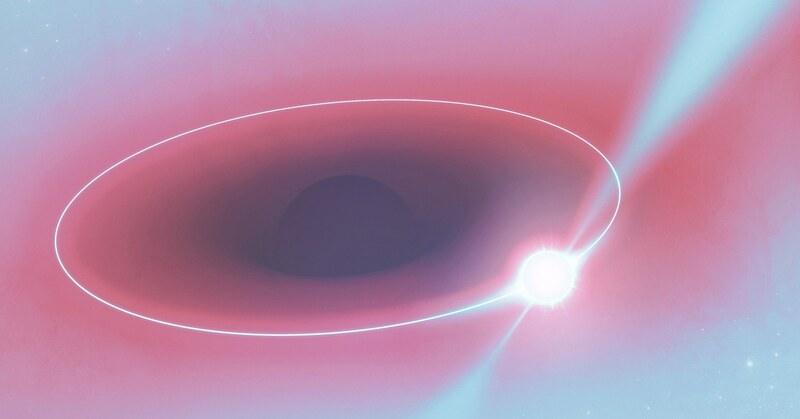 As it whipped around in the thrall of a giant black hole, the warped space-time predicted by general relativity would focus the hot spot’s light into a beam. And as that beam swept across Earth, we would measure the black hole flickering. “The black hole is like this lighthouse lens that’s causing this thing to flash at us as it goes around,” Broderick says. If jets caused the black hole’s flickering, that motion would be linear, as blobs traveled outward and cooled, Eisenhauer said. If clumps in the disk around the black hole were responsible, the motion wouldn’t go in any particular consistent direction. But the circular motion supports orbiting hot spots, the team argues. “There’s one particular fact that makes me inclined to trust this result,” said astrophysicist Gunther Witzel of the Max Planck Institute for Radio Astronomy in Bonn, who has worked with the galactic center teams on both sides of the Atlantic. GRAVITY also found that the light emitted during a flare shifts in polarization, following the same rough timescale as the apparent orbital motion. That fits, too. The light emitted by a hot spot would be polarized. As the spot traveled through warped space-time, its polarization would twist throughout its orbit. Now, though, theorists hope the hot spots may be able to shine a harsh interrogation-room lamp on Einstein’s theory of gravity itself. Consider a trip to a black hole. As you approach, popular accounts say, you have one last chance to turn back—the event horizon that marks the black hole’s edge. But perhaps a better place to rethink your approach would be earlier, at what astrophysicists call the innermost stable circular orbit (ISCO). The hot spots around the black hole at the center of the galaxy seem to orbit just a little outside this boundary. To Loeb, a light source flying around this fateful rim is a gift from Mother Nature. A black hole’s mass and its rotation speed determine where the ISCO is, plus how long a hot spot will orbit at a given radius. Beyond mass and spin, general relativity holds that nothing else determines how an object orbits an astrophysical black hole. These two values should be the only distinguishing characteristics. Ghez and Genzel have already established this particular black hole’s weight. And while they can’t yet calculate its spin, subsequent flares, especially brighter ones, should help nail it down. A black hole’s spin drags the space around it, changing how long it takes nearby objects to orbit. As GRAVITY builds up a catalog of flares, probing how long they take to orbit at different radii around the black hole, they’ll be able to infer what the black hole’s spin is. Of course, that’s assuming that general relativity is correct, and the orbits of objects around a black hole are determined solely by the black hole’s mass and spin. If it appears that something else is going on—that there exists some other factor affecting these orbits—it could hint that Einstein’s theory needs a tune-up. The next horizon—quite literally—should come from the Event Horizon Telescope, or EHT, a separate effort now straining to resolve the space-time right around the Milky Way’s central black hole. The EHT team is currently crunching through their data, with hopes to publish at some point in 2019, they say. EHT also hones its impossibly sharp vision through interferometry. But it operates in radio wavelengths, a thousand times longer than the infrared emission GRAVITY traces. And its component observatories span the entire world, not just a mountaintop in Chile. As Earth rotates, these observatories sweep across space, collecting even more information. While GRAVITY measured the black hole’s position with staggering accuracy every 30 seconds during a flare, the EHT aims for something different: a long-exposure picture of radio waves warping inside the ISCO, right around the black hole’s edge. But the hot-spotlike wobbles that GRAVITY found provide a new opportunity. “If these events happen quite often, and it looks like they do, that’s great news for everybody,” said Doeleman at Harvard, who directs the EHT.